Knowing the basics of cockroach behavior can drastically improve your cockroach control efforts. German cockroaches love wood, water and warmth, and you can usually find them there. If you hadn’t noticed, German cockroaches (Blattella germanica) have caught their second wind. Things were going remarkably well on the control side since the advent of the modern baits some 25 years ago, but in recent years, it’s becoming more common to find large cockroach problems. 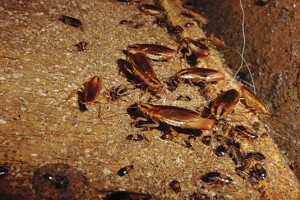 The default reaction of many pest management professionals (PMPs) to a nagging cockroach problem is to review their choice of baits and try a different one. We can be hopeful that our resourceful suppliers will be able to stay ahead of the game with quality baits, but every well-trained PMP should know how to eliminate cockroaches from a restaurant using only contact insecticides. To that end, it will serve us all to review the fundamental principles of German cockroach control. German cockroaches are heavily dependent on moisture sources, and they will congregate around the “water holes” of their world. In their natural environment (a kitchen), common water sources include pipe leaks, condensation from cold water pipes, and floor drains, just to name a few. They avoid light and will always settle in a shadow when one is available, the darker the better. Anyone coming into a dark kitchen infested with cockroaches will see a flurry of activity as the roaches scramble to get out of the light. Those PMPs who have participated in cleanout accounts have seen cockroaches scurry to “shelter” right under their shoes. This is always followed by a grin, a trite comment, and a non-chemical/shoe-centric solution for at least one cockroach. Cockroaches are thigmotactic. It’s a fun word to say, thig-mo-TAC-tic. Go ahead, say it out loud. It means cockroaches like to be touched on all sides, so they will slide into a crevice just large enough to accommodate their flattened bodies. Practically applied, it means we look for them where there are cracks and crevices. Like many other pests, cockroaches prefer warm areas. They can tolerate room temperatures, but if there is a warm spot, they’ll find it. And if you can find it, you’ll find them. Among the more common warm spots are the compressors of refrigerators or cabinets near stoves. They can harbor many places, but cockroaches prefer a porous surface on which to sit. Humans seek out the comfiest couch we can find; cockroaches seek out some surface capable of holding the scents and substances of other cockroaches. One of the more common surfaces in a kitchen that fits the bill is bare wood or fiberboard. Whether we use baits or contact insecticides, sound cockroach control demands we stick to the fundamentals for all applications.